So you pick him up, not sure whether to hold him at arms’ length to protect the rest of your outfit (although it’s already covered in that orange dye they seem to put in all children’s snacks), or cuddle him in close to prevent him dripping on the carpet. Either way, he has his back to the rest of the mummies, who wrinkle up their noses and hold their darling daughters a little tighter as they see the tell-tale yellow stain creeping up the back of his vest. Grabbing your changing bag you rush him into the bathroom and plonk him on the changing table, holding him with one hand to stop him wriggling off while with the other hand you rifle through the changing bag and silently pray that you remembered to repack some spare clothes after the last incident. Half a packet of wipes later and he is looking angelic in a fresh nappy and clean clothes. You roll up your sleeve to hide the remains of the stains and try to tweak your hair into a slightly less dishevelled mess before re-joining the throng, who have by now completely forgotten the incident and are cheerfully comparing Bugaboos on their way out. Not every nappy explosion has such a happy ending. Now imagine you weren’t at a baby group but another everyday activity – out shopping, maybe, at the railway station, or in the pub. Imagine your son wasn’t six months but six years, or sixteen, or sixty. Imagine he’s in a wheelchair. You can’t lift him onto a baby changing table, in fact the changing table is too small and won’t take his weight anyway. If you’re going to get him laying down, you need a hoist to lift him and a full-sized bench to lay him on. That’s if you can get his wheelchair into the bathroom at all, along with yourself and his feeding pump, suction equipment or oxygen tank, let alone your shopping! What do you do? What do the quarter of a million people in the UK, who cannot use a normal toilet or a standard disabled toilet, do? What happened to health and safety? If travelling by car, some families change their disabled members on the back seat or in the boot, in the open air for all to see. Some disabled people – especially those too heavy for others to lift, i.e. most adults – simply can’t go out, at least not for longer than they can guarantee not to need the toilet. Imagine if you couldn’t go out for more than two, three hours at a time, ever, just in case you needed to pee. Imagine if you couldn’t take your child out just in case they needed to pee. What happened to inclusion and access for all? You may not always need to imagine. You may (God forbid) be in an accident. You may get sick. You may just get old. It could be you. Soon, it will be us. My son Benjamin is a charming, happy little boy. He loves to feel the wind on his face, see the sun shine through the leaves of the trees in the park, to watch movies and, particularly, to flirt with any brunette that walks past. He also has quadriplegic cerebral palsy, is doubly incontinent and, aged nearly three, weighs 14 kilos. That’s already too heavy for many baby changing tables – unsurprisingly, because he’s no longer a baby. Yet that which is almost universally provided for babies these days – a safe, hygienic and dignified place to change – is rarely provided for children and adults. Suddenly, just because he is older and bigger (both things we are immensely proud of), his safety and dignity are taken away. Our immunocompromised little boy will have to be laid on a dirty toilet floor, or spend the day sitting in his own excrement, or be confined to the house. You don’t have to be incontinent to face this, you simply have to be unable to transfer from a chair to a toilet without help or a hoist. Or even to use a wheelchair too large to fit into many disabled toilets. Our heroic paralympians, our war veterans, our elderly relatives. It could be you. It doesn’t have to be like this. 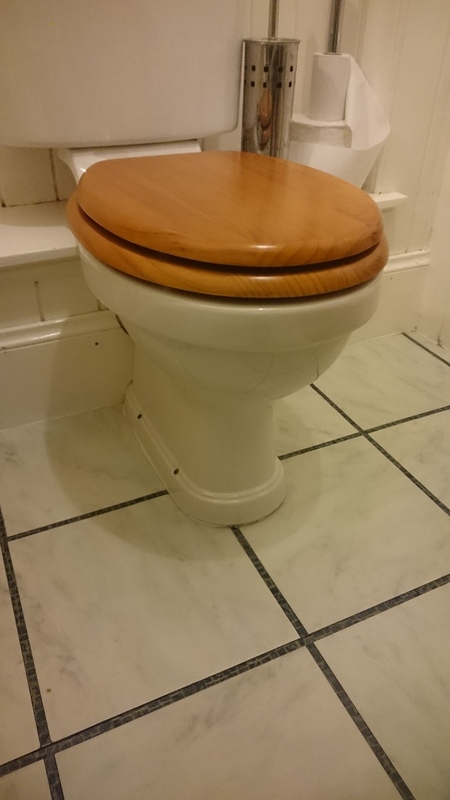 What if someone designed a toilet with a height-adjustable bench large enough for an adult to lie on in safety, a hoist to transfer them to it, and enough space to get a wheelchair and a carer (if necessary) alongside? What if? It might surprise you to know that someone already has. It’s called a Changing Place. Why have you never heard of it? Because there are only about 900 in the UK. That’s one for every 2500 square kilometres. Disabled toilets are not enough. Changing Places are so important to the battle for inclusion and equality. In our nearest city, Edinburgh, there is no Changing Place at the airport, in the railway station, in any of the museums or galleries, or anywhere on the main shopping street. Not in John Lewis, nor Marks and Spencers, not in Harvey Nichols nor the famous Jenners. The Equality Act 2010 requires organisations to make ‘reasonable adjustments’ towards accessibility and that just isn’t happening. We don’t need a Changing Place in every corner shop. But we do need one in every hospital, airport, department store, motorway service station, and town. It might not matter to you now, but one day it will matter to you or one of your loved ones. One day, it could be you.